This was a really cute game! I had fun! Hi, I did not completely disappear yet. Obviously I didn't finish this in time for it to be part of the jam, but I would like to make a post about what I've learned and how I felt during this jam. First off, I went into this jam feeling confident and with high hopes. I felt very good about how the jam went last time and because of that and other practice I had done I thought I would do very well. I aimed higher than last time and decided I would use more colors and try to make something unique instead of just another easy platformer. I also thought it would be nice to help someone else out, because I want everyone to be able to make games. The problem is I didn't find out how much work the person I was helping wanted me to do, and that's on me. I should have figured out exactly how much work they needed before I agreed. This is thing #1 in my list of things I learned this time. I still felt confident, but doing that much pixelart at once was way more than I was used to. I got super stressed and tired which made working on my own game very difficult. Another problem is that I was so confident that I waited until a day or so before the jam to decide what I was going to do. All of my ideas were for games I had no clue how to make, because I wanted to learn a lot this time. I should have decided on one weeks before the jam and looked into some tutorials to help me. If I had, I might have been able to finish this instead of messing around after I finished some tiles for the other game. So, what is the fate of this game? Well it was part of a larger idea I wanted to do of a few different board games you could play. I still very much want to make that so I'll keep working on it. Despite making barely any progress on my personal project, I feel good that I helped someone else with their game and I learned a lot about stuff I should do in the future. Thanks again for the jam and the community, sorry I messed up lol. Speaking of me, here I am. First let me show you Apollo's first enemy enjoying a nice walk with him. Also here is a peek at the third level. I think this will be the last bit of art I show in here, because it will be more fun to see stuff in the game for the first time. The game now randomizes the tiles. Right now they have an equal chance of being placed, but once I have a few more tiles in the game they will have different probabilities. 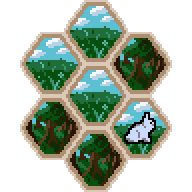 I also want to try to attach some rules to them so you don't get like 12 forest tiles in a clump. Also you might have noticed a couple new tiles in here. I added lakes and mountains. I'm probably going to redo the lake, but the mountain looks pretty nice I think. I also did slight anti-aliasing so they look nice when they're together on the board. Tell me your opinions on them. I'm not sure how long all of that will take, but those are my goals for the foreseeable future. You can already move the piece around the board, but it doesn't look pretty so I didn't make a gif. This is all really cute! Your talksprite is beautiful! This mockup of the game board. 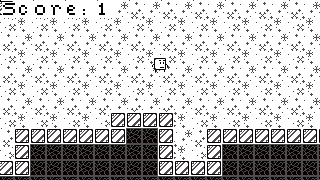 Only two terrains pixelled so far, but this is the basic idea. You will move around the board and more of these little tiles will get placed around the edges. Me too! Fara is so beautiful looking! My game is going to be a virtual board game where a team of four pets try to find their way home after being separated from their owner. I had been thinking of board game ideas involving pets for a while, so when I found out the optional theme I knew exactly what to do. My "spin on a popular story" is a version of Homeward Bound: The Incredible Journey! The spin I guess is that its not just 2 dogs and a cat. Since I'm also doing all of the pixelart for another game this is starting pretty slow. Nevertheless, I wanted to make a thread and post my concepts and what little work I've done! 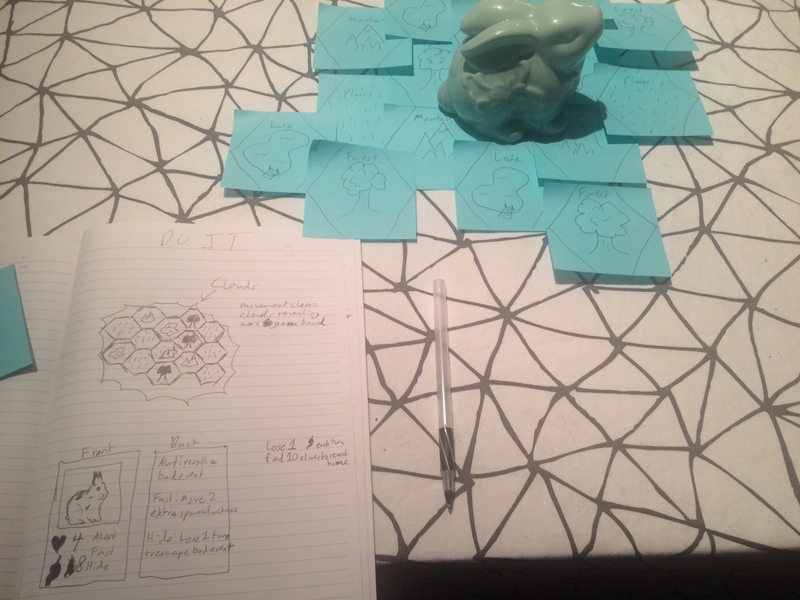 First off I have written a lot of notes and concepts for how I think the game should work. At this stage, I'm not completely settled on the exact way things work, but I have ideas that feel very board-game-y. Also please ignore my 2nd grade level handwriting. The game is played by moving around the board, which is comprised of hexagonal panels. As you move toward the edge of the board more panels are revealed. When you land on a space an event will happen that can either harm you or help you find your way home. 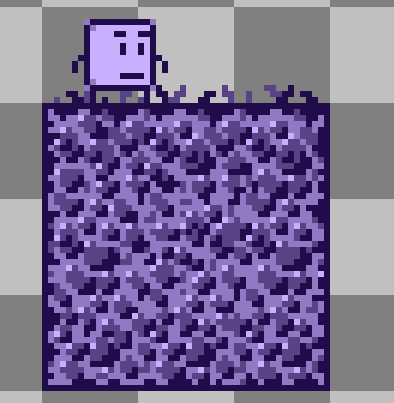 I'm planning on making some terrains safer than others, but maybe making dangerous ones also offer larger rewards. There will also be special terrains that rarely appear but give you a good event guaranteed. Right now I'm thinking you collect "Clues" and once you have 10 your home is revealed and you only have to make it there to win. Each animal will have different stats and perks, which can help avoid some events or make it easier to find clues to get home. I'm hoping to get 5 pets into the game during the jam. You'll be able to play as a Rabbit, Cat, Dog, Bird, or Turtle. Here is the character portrait for our first pet. This is Baozi. She is my now deceased pet rabbit who shall live on through my art. I'm planning on rabbits being able to move further because they're fast and be able to avoid bad events sometimes because they are very alert. They will also have less health than some of the other animals, so be careful. I'm hoping to have a small card with relevant information about your pet, each of which will have a lovely portrait like this one. the art for the gameboard will not be quite this high-res, so don't worry, I should survive making this. Hello I'm doing pixelart for this! 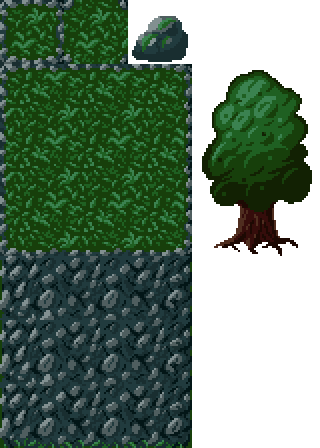 I made a whole bunch of tiles for the first area which is a forest. 2. I was in the previous jam and I made Bipo's Adventure! I finished it with 5 levels during the jam, and after the jam I updated it to make the levels bigger and add more stuff. I'd like to try something different this time since a lot of the platformer engine needs I had were already in Construct 2. I want to challenge myself more this time. 3. Some of my favorite games are Wind Waker, Chibi-Robo, Xenoblade Chronicles, Kirby, Undertale, and Animal Crossing. The closest to inspiration for Bipo's Adventure was Kirby as far as the simple looking character and cute style. Almost any video game I've played has inspired me to make games. 4. 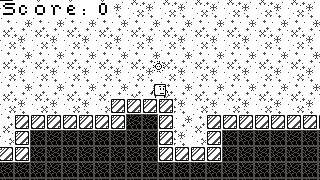 While I had fooled around with some game making programs before, the first "my first" jam was... my first game(jam) ever. So my gamedev experience is I did that one jam. I improved the game around a month after the jam ended and I'm pretty pleased with how that went. 5. My passions are rabbits, music, rain, my wife, playing bass, pixel art, any magical or sci fi world, and also Overwatch right now lol. I'm really excited to finally make a game again! I hit a rough patch so to speak right after the last one ended and never really got back to it. Also excited to see all the cool entries (or even cool stuff that doesn't get finished) during this jam! Good luck everyone! YOU CAN DO THIS! I didn't really consider if the 1x1 blocks were difficult. I'll keep that in mind when I'm reworking the flow of the levels. I'm glad you enjoyed my music and pixels! Thanks for the feedback. I don't browse tumblr so I only have peoples twitter handles to share. Here is mine @tentril and hopefully I will be posting more about gamedev stuff in the future. Here are cooler people to follow. @DreamsBell - Making Jack the Reaper, a Kirby inspired platformer where you play as a cute grim reaper. @rabbit_nabokov - Making the Momodora series of games. I guess you'd call them Metroidvania? @SinksAdventure - Made Crowtel, a cute platformer about a crow running a hotel! This is a fun arcade style game! I would have liked it if I could use keyboard buttons instead of clicking all over the mouse though. My right hand got tired lol. Loved those nukes! The difficult route definitely felt too difficult on the last level, but I'm not sure if it was just the level or the lack of visual feedback. By that I mean, since I was playing as a box I had no animation cues for how fast I was going or if I was at the top of my jump. It also felt like I would slide into obstacles when I was trying to stop in front of them. I thought it was a very interesting concept, but I don't really like green being the easy path and red being the hard one. Green and red are often used to mean right/wrong or good/bad so it felt too much like the game was telling me which was the morally right thing to do. It would feel more ambiguous if they were the same colour and the difficulty of the actions would clue us into how hard the next level is. Speaking of which I feel like the actions themselves should be the deciding factor in the difficulty since some people might have different emotional connections to certain things that might change what they think would be the more emotionally difficult choice? idk if that makes any sense, but I saw a few where the easy choice was to take action and the difficult choice was to do nothing and I feel like that is backwards. After writing all that I feel like I'm sounding overly negative, but I think you have a really cool idea! Just a few tweaks to some of the scenarios and maybe a few more of them and it will be great! Yeah after hearing some people's thoughts I'm thinking I'll change a bit of the layout and make the timer longer. I want the levels to encourage exploration more than they do now, because that sounds more fun and less difficult. Your game is so cute and you did so much for just two weeks! Very impressive! This is really good! Perfect gameplay for an arcadey kind of game. Took me a bit to do it, but I beat the boss. Really cool concept! Good work! Didn't see any bugs when I played it and the 3D model the box dreams of being is cute. This is a pretty interesting game idea! It was very fun! This was really fun! I only found one secret passage, and its a really cool thing to hide! While I'm sure the majority of other jammers are quite familiar with standard PC platformer controls I also wanted some of my friends and family to try this out so I wanted to be very clear lol. Speaking of which I'm probably going to try to redo parts of the levels to make some of it a little easier so beginners can play more of it. When I'm doing that I'll keep these comments in mind, but I definitely still want that great feeling of beating a tough last level. Thank you very much for the reply! I definitely think I'm going to revisit this in a few days to make the difficulty increase more smoothly, so this kind of stuff is helpful. I would like if it were a nice game for beginners to try out, but I'm no beginner at platformers so it was kind of hard to judge what was too hard. I had "tried" before but barely. I'm totally with you on this thought. I've wanted to make a video game for a long time and now I have! I changed my twitter bio to reflect that I can technically be called a gamedev now lol. Thanks! I had the idea for the invisible platforms back when I thought I'd have ten levels, so I was hoping to slowly reach that difficulty. I ran out of space in Construct but I still wanted to have it in the game lol. I'm glad you liked it! My First Game Jam community · Posted in Bipo's Adventure - Finished! I made a whole game. Edited the first post so people can find the link easier too. I haven't really given this project my full focus the last few days, but I've made a little progress and I'm still confident. Here is a sneak peek at my parallax! Now with clouds and more trees! My First Game Jam community · Posted in We're over the halfway point, how's everyone doing? I definitely had higher hopes for myself going in, but I was also ready to accept that it was too much. After taking a little break for about a day I feel like I've caught my second wind. No matter how this ends I learned a lot and it was fun! Here is the latest scoop. Working on a parallax background and I feel pretty good about it. I've spent most of today and last night working on this to make sure it looks good. Hello! I have not given up, and I am not planning on it. I was feeling a little burnt out so I took a day off. Now that I'm back I am full of purpose. Decided all this white would be hard on the eyes when someone plays this for more than a few minutes. To fix that I'm switching to a gameboy-esque set of colors, but with purple instead of green. Clearly I need to do some cleanup on these tiles, because i can see a few areas that are lined up to nicely. I figure since I hit a wall with the engine I'm going to just start making levels and art assets. Soon I'll start learning how to do music in famitracker. I also want to try to make a simple parallax background to make the character easy to see. Hopefully I'll have enough good posts in here in time to make the day 12 highlights or something lol. So I've added a few new things, but I'm losing steam. I really wanted to come up with something for this character to do besides just jumping. If I can't figure it out by tomorrow I'll just skip that and make a few levels with what I have. I have implemented a countdown timer. I put in my own sprite font instead of the huge default one in Construct. Added the events to take you to a "win" screen when you get all the things in the level and a "lose" screen when your time runs out. When "ok" pops up it should pause the same as the sign text, but the timer and the collectibles keep going so it just freezes the player. They're using identical events so I really don't get what I did this time. This is resolved now. I tweeted it and @yurigods helped me. basically since it checks if either IsPaused is happening they can interfere with each other so I need just one Boolean to control all pausing instead of the separate ones. Also I just realized that GifCam defaults to like 10 frames a second and it makes my game look bad lol. Here is a big fancy gif to show my little animations better. My First Game Jam community · Replied to J in Bipo's Adventure - Finished! Thank you for the compliment and the html tip! I'm still brainstorming new moves but it's pretty tough. If I start taking too long I'll just wing it and start adding whatever until something sticks. My First Game Jam community · Replied to NN Chan in Bipo's Adventure - Finished! Thanks! I've been struggling with animation so I'm glad my work is paying off. Figured out how to add a score display and made a thing to get score. This is looking really good! I love these animations and you already have so many things implemented! My First Game Jam community · Created a new topic Bipo's Adventure - Finished! My game is finished! Five levels to play and a title screen, end screen, and level select to... look at? This was a lot of work and I'm glad it worked out. Here is a little video showing what I have working so far. I am making this in Construct 2. After a few hours of work last night I have basic movement and camera working how I want them. Art assets aren't final, but are pretty close to what I'm going to use. I figure if I limit every aspect of this it will be more likely I can finish it. I still want to figure out another way of moving to make this stand out more instead of being a cookie-cutter platformer. 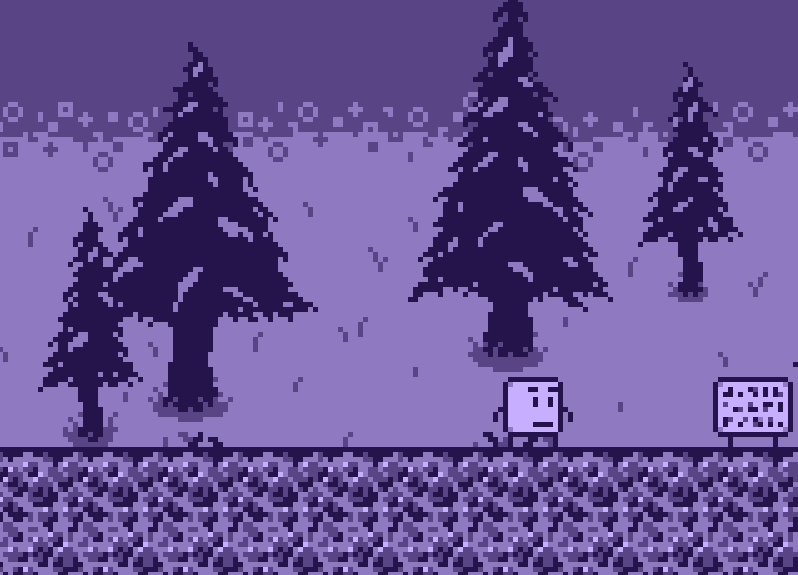 Once I have all of my engine stuff sorted out I'll probably go straight to making levels and then more art. I'm pretty pleased already honestly, since this is already much farther along than most things I've tried to make in Construct.